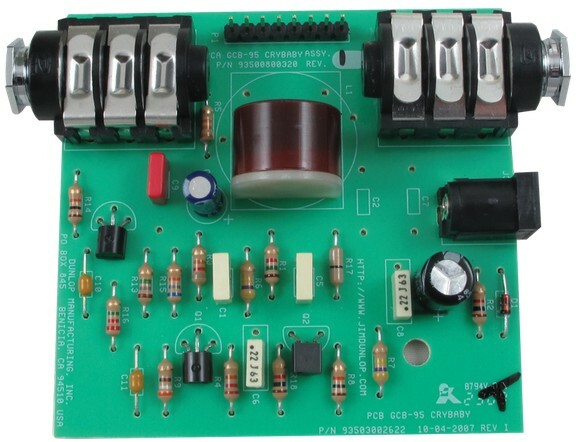 larger view REVISIT EFFECTS PEDAL POWER SUPPLY 9V DC, 1.6 amps. Input voltage from 100V AC to 240V AC. Output 9 volts DC, 1600mA, fully regulated. 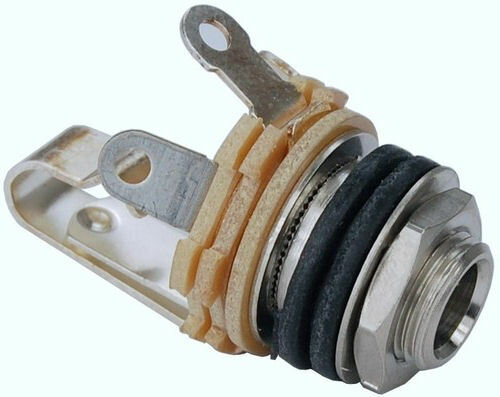 Connector is a 2.1mm inner diameter, center negative, outside sleeve positive. Perfect for most pedals which are 9V battery powered. This compact supply will power up to 10 pedals (assuming each pedal requires 160mA or less). 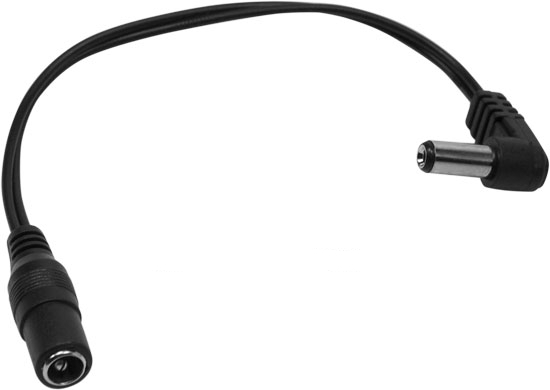 For powering multiple pedals, see the DCC10X8 cable, below. Consists of a 9V battery clip wired to a 2.1mm x 5mm power connector - wired for positive center. Add a 9V battery and you have a quick emergency power source for a pedal with a dead battery. You know, you carry a few spare 9V batteries with you to a gig, but when your pedal dies during a set there is no time between songs to take it apart to swap the battery. With this ingenious device, you will be up and running again in seconds. 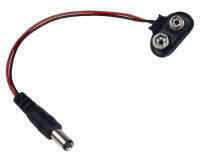 If you need a negative center power source for a particular pedal, add the PRC-127 cord below to reverse the polarity. 9V Battery not included. Fixes the frustrating problem of having a power supply designed for "center pin positive" and a pedal which requires "center pin negative". Or vice-versa! 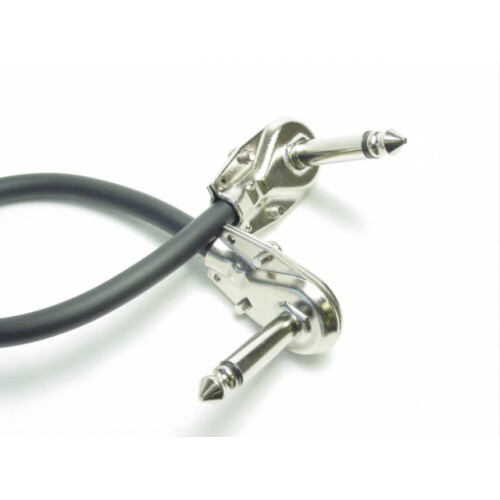 This ingenious adapter cable reverses the center pin with the outside ring, allowing you to successfully use a "backwards" pedal with your pedal power supply. 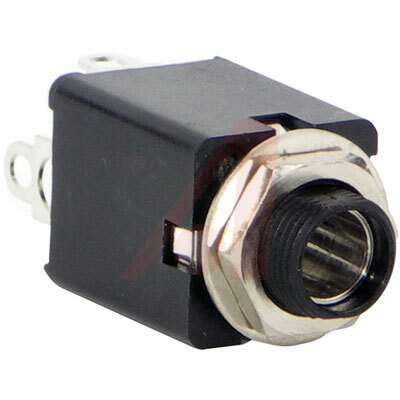 The connectors are the popular 2.1mm x 5.5mm size. 6 inches long, with a right-angle plug to connect with the pedal. The two most common connectors for AC Adapters are 2.1mm x 5.5mm and 2.5mm x 5.5mm. 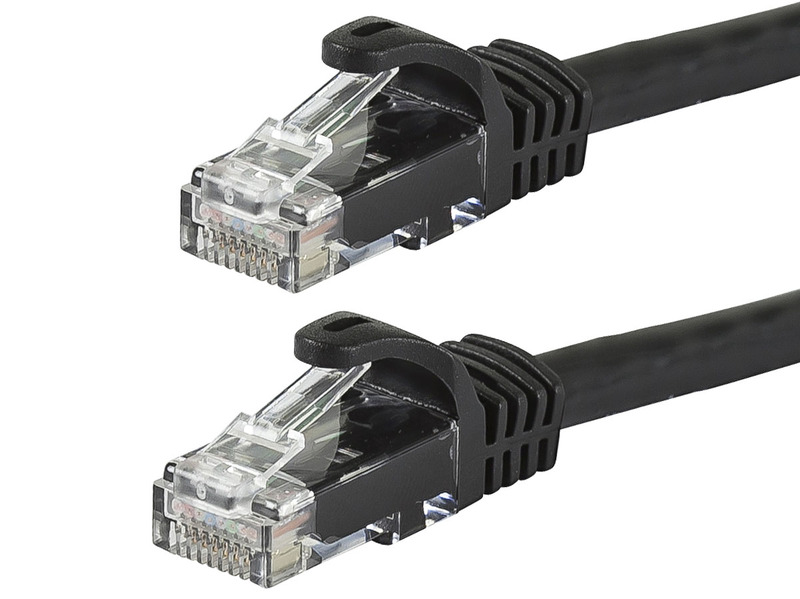 The outside diameter of these two connectors are identical, but one uses a larger pin than the other, and therefore they are not compatible. This Adapter has a 2.1mm pin in the back, with a 2.5mm hole in the front, for cases where the pin in your pedal is just a tiny bit too large for the Adapter. 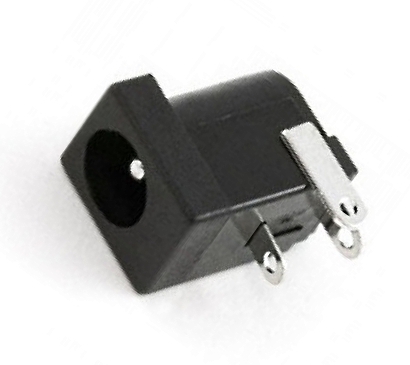 The two most common connectors for AC Adapters are 2.1mm x 5.5mm and 2.5mm x 5.5mm. The outside diameter of these two connectors are identical, but one uses a larger pin than the other, and therefore they are not compatible. 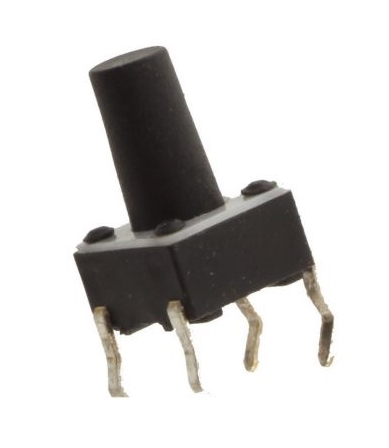 This Adapter has a 2.5mm pin in the back, with a 2.1mm hole in the front, for cases where the pin in your pedal is just a tiny bit too small for the Adapter connector, and your power is intermittent when you move the Adapter cable. 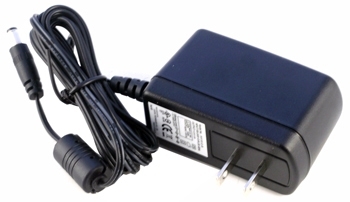 Handy way to add a power jack for an AC/DC Adapter to an existing devices. Connector fits the popular 2.1mm x 5.5mm barrel plug found on many Adapters. Normally closed switch, so that an internal battery may be switched on or off automatically as the Adapter is connected. 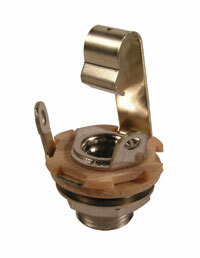 Plastic housing isolates both conductors, so it may be used for either center positive or center negative Adapters. Fits 1/2" chassis hole. Replacement barrel power plug for many AC Adapters. 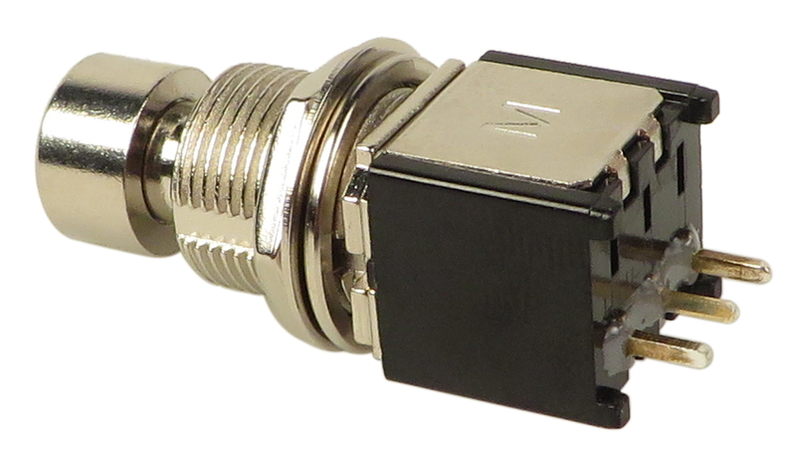 Connector is the popular 2.1mm x 5.5mm barrel plug found on many Adapters. Soldering required to attach to cable. larger view 9V BATTERY CLIP. Commonly found in effects boxes. Simple, yet durable construction. 5 3/4" red and black leads. larger view Dunlop® DROP-IN BATTERY BOX FOR CRYBABY. New style replacement battery holder for Dunlop® CryBaby pedals. Works with all GCB95 style Crybaby pedals with a rectangular cutout in the bottom panel for the battery. Replaces the original battery clip which was prone to breaking. Original Dunlop® replacement part. Original Dunlop® "slide pad medium" (4 ½" x 3 ⅜"). Perfect fit for MXR® Phase 100 and other similarly sized pedal enclosures, including Hammond® Mfg 1590BB. Self adhesive backing allows it to be easily secured to the bottom of an enclosure's cover plate. Use as an alternative means to rubber feet for adding grip between the pedal and the floor. Can be easily trimmed with scissors to fit smaller Dunlop® pedals (such as the MXR® Phase 45 or Phase 90) or pedals of other brands. Dunlop® Crybaby standard foot tread with adhesive backing. 55mm wide at heal end, 67mm wide at toe end, 193mm long. Original replacement part for Dunlop® 105Q Crybaby Bass Wah, Dunlop® 535Q Crybaby Multi-Wah, Dunlop® 95Q Crybaby Q-Wah, GCB80, Dunlop® GCB95 Original Crybaby, Dunlop® Dunlop® GCB95 Original CrybabyF Crybaby Classic Wah, Dunlop® JD-4S Rotovibe Expression Pedal, Dunlop® UV1FC Univibe Controller Pedal and others. 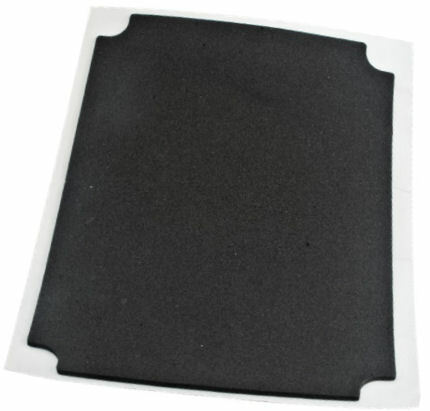 Dunlop® felt pad with adhesive - attaches to underside of foot platform, cushions contact with toe switch. Approximately 11/16" in diameter. 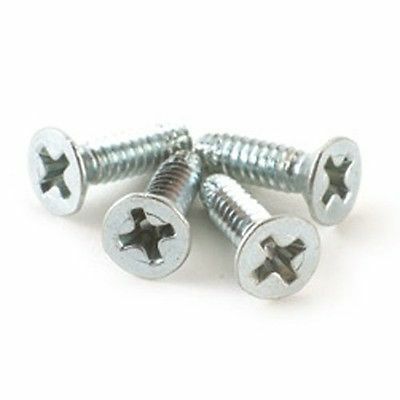 Set of 4 housing screws for MXR®, Way Huge and other pedals which use 6-32 x 1/2" screws, including pedals which use Bud or Hammond style enclosures. Replacement screws for Dunlop® DCB10 DC Brick, MXR® M101 Phase 90, MXR® M102 Dyna Comp, MXR® M103 Blue Box, MXR® M104 Distortion+, MXR® M115 Distortion III, MXR® M132 SuperComp, MXR® M133 Micro Amp, MXR® M134 Stereo Chorus, MXR® M169 Carbon Copy Analog Delay, MXR® M173 Classic 108 Fuzz, MXR® M182 El Grande Bass Fuzz, MXR® MC401 Custom Audio Electronics Boost, MXR® MC402 Boost Overdrive, Dunlop® ZW44 Zakk Wylde Overdrive and others. 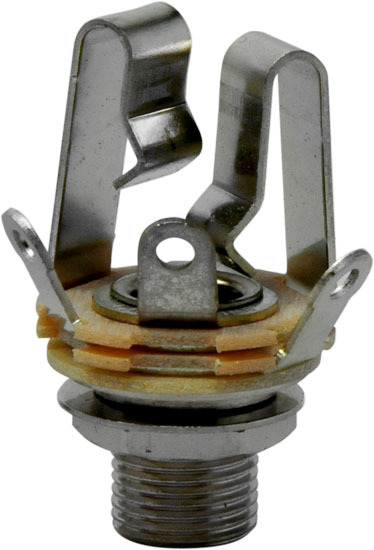 Long life replacement bulb used for both the pilot lamp and also to drive the photocell in all Morley pedals from 1983 through current models. Pedal not working? In most cases, it just needs a new bulb. 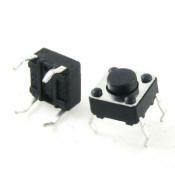 Replaces the square channel-switching indicator LED in many Fender footswitches. 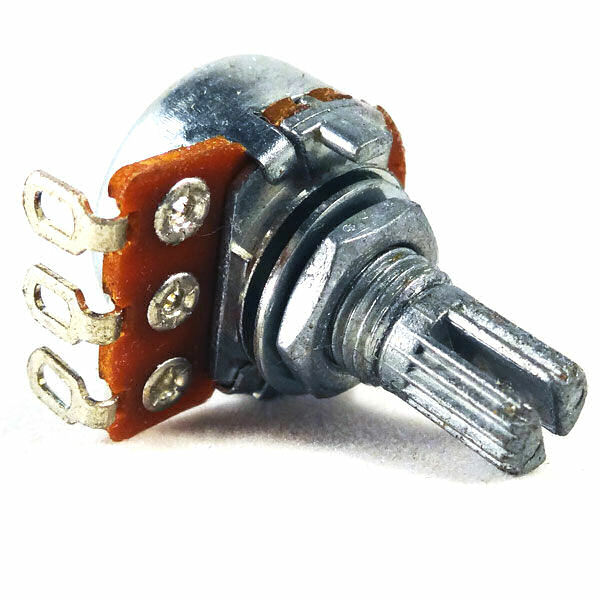 This LED is part of the circuitry in many Fender footswitches, and its failure often means the channel switching stops functioning correctly. Replaces original Fender part number 028039. Found in the 028122 and 050419 Fender footswitches, as well as several others. 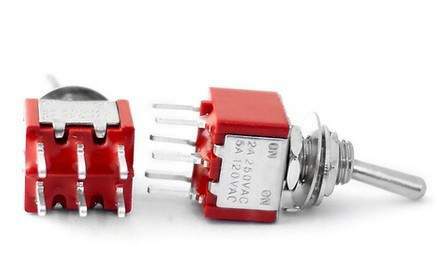 This LED is red only - will not replace the bi-color footswitches used in some of these amps. 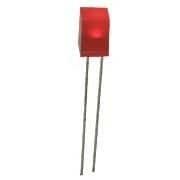 Standard 5mm (3/16") diameter red LED found in many guitar amplifiers and effects pedals. 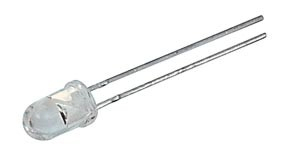 On LEDs the longer leg (the anode) goes to the positive voltage supply. LEDs need a DC supply voltage and a resistor in series with them to limit current. For a 9V supply, a 470 ohm resistor works well. For 12 volts, a 680 resistor resistor, and for 15 volts, a 1K resistor. 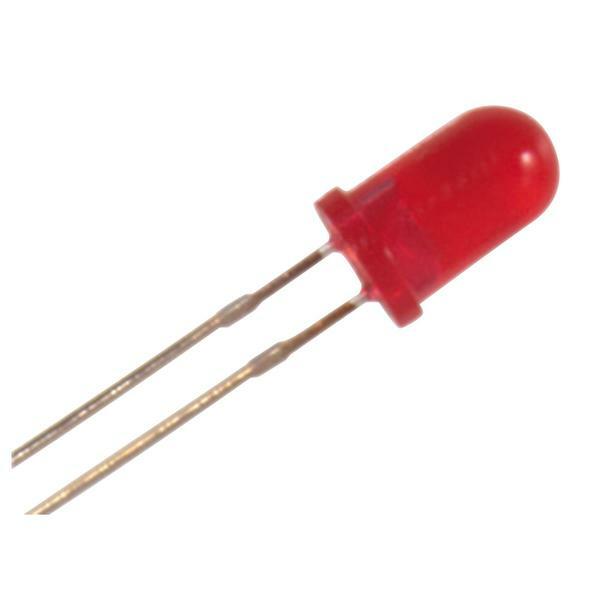 Standard 5mm (3/16") diameter waterclear red LED found in many guitar amplifiers and effects pedals. A red waterclear LED looks clear when it is off, and emits a bright red light when power is applied. On LEDs the longer leg (the anode) goes to the positive voltage supply. LEDs need a DC supply voltage and a resistor in series with them to limit current. For a 9V supply, a 470 ohm resistor works well. For 12 volts, a 680 resistor resistor, and for 15 volts, a 1K resistor. larger view 5mm LED BEZEL (fits in 8mm hole) Available in black or chrome! Mounting bezel for standard 5mm (3/16") diameter LEDs found in many guitar amplifiers and effects pedals. Not plastic ... these bezels are metal, with metal threads and a metal nut and lock washer. Long threads for mounting in thicker panels up to 5mm thick. Nylon insert holds the LED. LED may be removed from the rear side without removing the bezel from the panel. 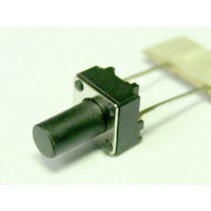 Fits our LED-5R-D, LED-5R-WC, and any other standard 5mm LED. LED not included. The ultimate time saver! This is an LED mounted in a bezel with a resistor and shrink wrapped wires. Length is 19mm long - 16mm of which is below the mounting area. 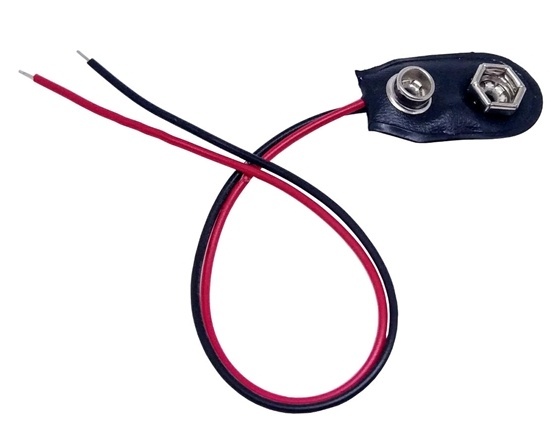 These Prewired LEDs are designed for 8V to 12V DC - no dropping resistor needed. The length of the wire is about 6.5" Mounting hole is 8mm, LED color choice is red, amber, green, blue or white. 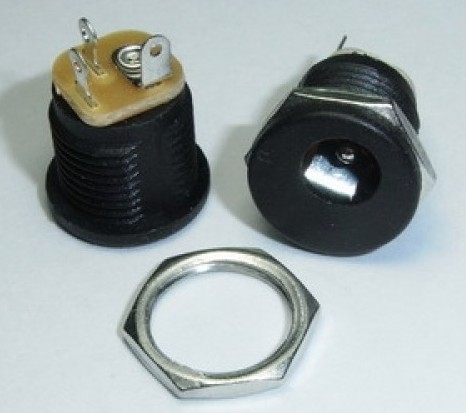 These replacement nuts fit all Carling® brand footswitches and toggle switch and some (but not all) other switches which are not made by Carling®. 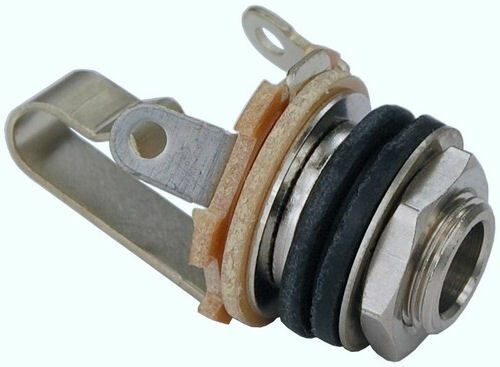 Carling® toggle switches are used in Fender® amps. Hex outer surface (9/16"), M12 thread for 15/32" bushing. Found in many type of footswitches, including the earlier versions of the Dunlop® Crybaby Wah pedals (NOT the version F - see FS-435 below for Crybaby GCB-095F). Has 3 electrical terminals (single pole, double throw). Solder lugs for wire. Made by Carling®. FOOT SWITCH, CARLING® BRAND, SPST, REPLACEMENT FOR Fender®, ETC. SPST footswitch, soft touch pushbutton footswitch. Normally open. These are good for tap tempos, loopers (such as the Electro Harmonix 720 Stereo Looper) and anywhere you want the option for a constant or fast foot tap. They're also ok for hand use as they're not too hard to push with fingers. Has 2 electrical terminals (single pole, single throw). Solder lugs for wire, normally open. FOOT SWITCH, CARLING® BRAND, DPDT, FOR SWITCHING AND EFFECTS. 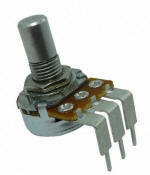 Replacement DPDT footswitch for MXR® and Dunlop® pedals. Dunlop® BG95 Buddy Guy Wah, Dunlop® GCB95F Crybaby Classic Wah, Dunlop 535Q Crybaby Wah, Dunlop® JD-F2 Fuzz Face Distortion, Dunlop® JH-F1 Hendrix Fuzz Face, Dunlop® JH-OC1 Jimi Hendrix Octavio, MXR® M101 Phase 90, MXR® M102 Dyna Comp, MXR® M103 Blue Box, MXR® M104 Distortion+, MXR® M107 Phase 100, MXR® M134 Stereo Chorus, MXR® M169 Carbon Copy Analog Delay, MXR® MC401 Custom Audio Electronics Boost, MXR® MC404 Custom Audio Electronics Wah, Dunlop® SW95 Crybaby Slash Wah. Made by Carling®. larger view FOOT SWITCH, DPDT, FOR SWITCHING AND EFFECTS. Electrically equivalent to FS-497, but with a smaller switch body. Has 6 electrical terminals (double pole, double throw). Solder lugs for wire. larger view FOOT SWITCH, DPDT, LATCHING, PC MOUNT, FOR SWITCHING AND EFFECTS. Electrically equivalent and physically the same body size as the FS-498, but made for direct connection to a PC board. Found in the Line 6® XPS-AB power supply for their Variax guitars. Has 6 electrical terminals (double pole, double throw). 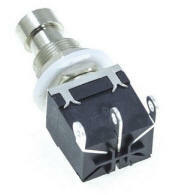 larger view FOOT SWITCH, SPDT, LATCHING, FOR SWITCHING AND EFFECTS - Marshall® TYPE. Has 3 electrical terminals (single pole, double throw). Solder lugs for wire. 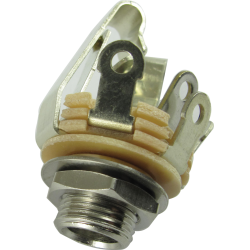 Commonly found in Marshall® footswitch boxes, as well as other brands. Marshall® part number SWP802. larger view FOOT SWITCH, SPDT, MOMENTARY, FOR SWITCHING AND EFFECTS. Has 3 electrical terminals (single pole, double throw). Solder lugs for wire. 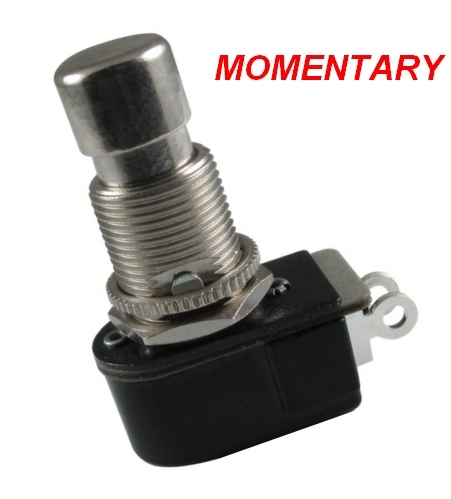 This is a "soft click" momentary switch - not latching. See drawing for switch open/closed arrangement. Electrically equivalent and physically the same body size as the FS-398, but made for direct connection to a PC board. 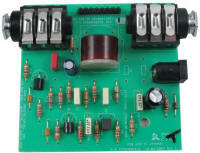 Found in the some Marshall® footswitch boxes with PC board design. Has 3 electrical terminals (single pole, double throw). 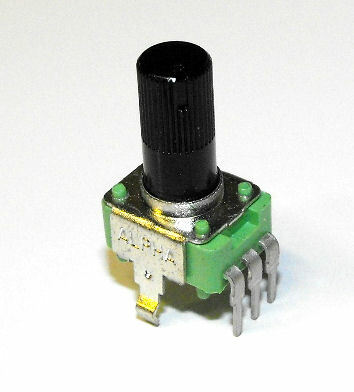 larger view FOOT SWITCH, ALPHA MINIATURE DPDT, LATCHING, PC MOUNT, FOR SWITCHING AND EFFECTS. 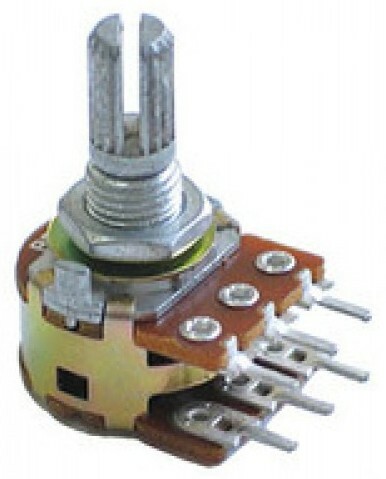 Smaller body than the FS-498-PC, this switch is used in many stomp boxes. 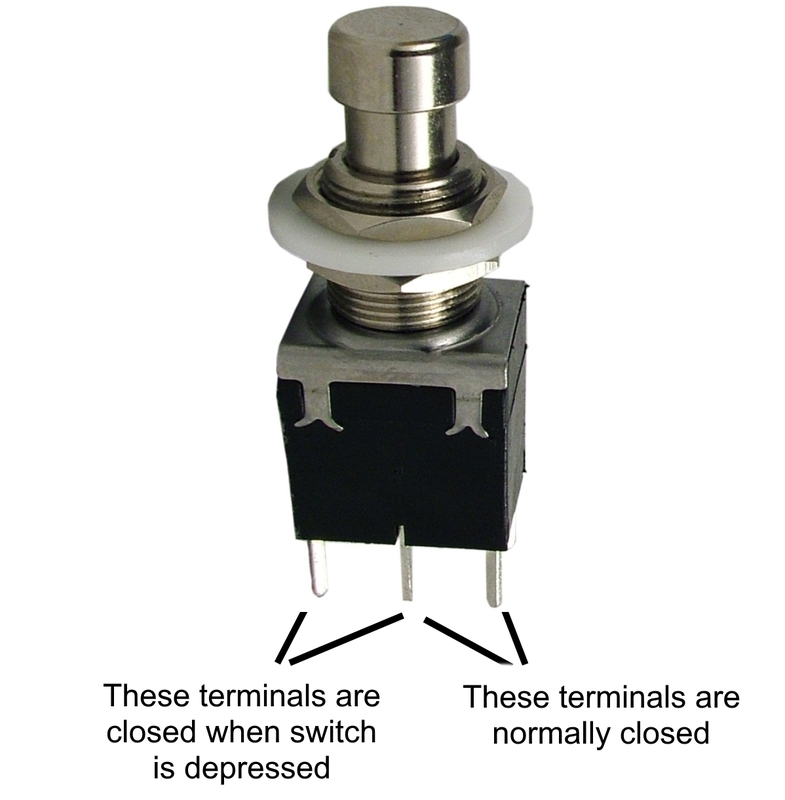 The physical size of the pushbutton is the same as all of the other switches - only the rectangular body of the switch is smaller for more compact spaces. This is a "firm-click" switch - not a momentary. Switch is marked "L" on the side (for "latching"). This is a shorter version than used in MXR® pedals - will not fit MXR®! Order the D-ECB554 for MXR® pedals. larger view FOOT SWITCH, ALPHA DPDT, LATCHING, SOLDER LUGS, FOR SWITCHING AND EFFECTS. 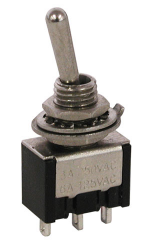 This switch is the same as the FS-211-PC, except it has solder lugs for wire attachment. Made for effects boxes that do not have a PC board under the footswitch. 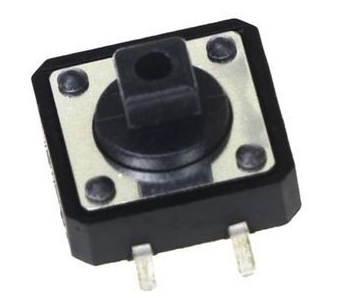 The physical size of the pushbutton is the same as all of the other switches - only the rectangular body of the switch is smaller for more compact spaces. This is a "firm-click" switch - not a momentary. Switch is marked "L" on the side (for "latching"). larger view FOOT SWITCH, ALPHA DPDT, MOMENTARY, PC MOUNT, FOR SWITCHING AND EFFECTS. This switch is the same as the FS-211-PC, except it is a soft-click momentary (no firm click) for those pedals which require a momentary switch. Switch is marked "M" on the side for momentary. 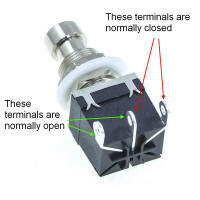 Momentary switches do not latch - once the switch is released, the contacts revert to their normal state. Pins for PC board mounting. 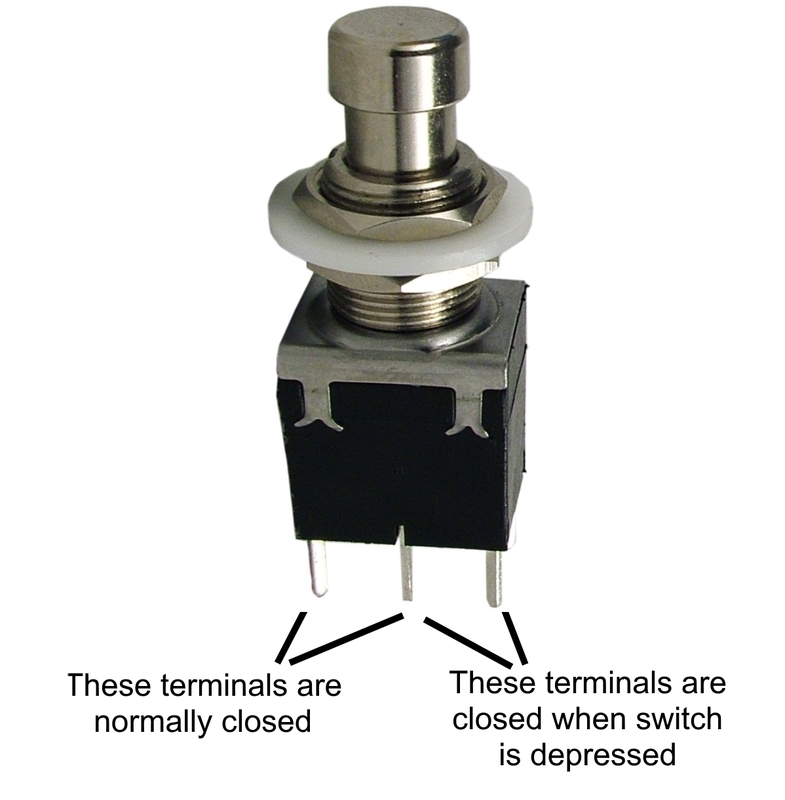 The physical size of the pushbutton is the same as all of the other switches - only the rectangular body of the switch is smaller for more compact spaces. 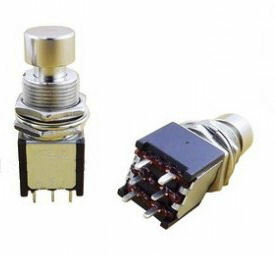 Note: With momentary PC Mount switches, it is necessary to check the pins with a meter and determine the normally open and normally closed pins, comparing to the original switch and design before installing. Otherwise, it is possible to install a momentary switch "backwards" (reversed 180 degrees) and the device will not work properly. larger view FOOT SWITCH, ALPHA DPDT, MOMENTARY, SOLDER LUGS, FOR SWITCHING AND EFFECTS. 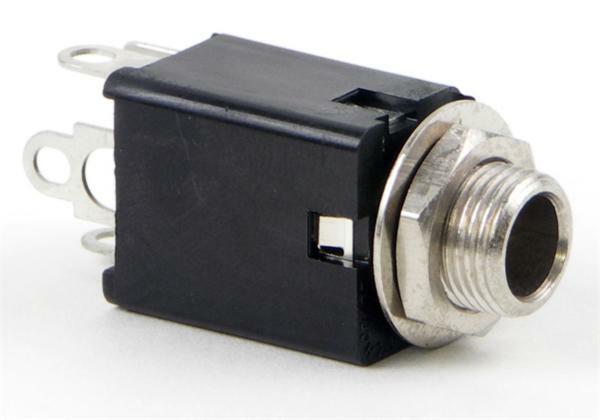 This switch is the same as the FS-211-PC-M, except it has solder lugs for wire attachment. This switch is a soft-click momentary (no firm click) for those pedals which require a momentary switch. Switch is marked "M" on the side for momentary. 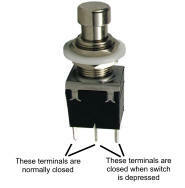 Momentary switches do not latch - once the switch is released, the contacts revert to their normal state. Made for effects boxes that do not have a PC board under the footswitch. 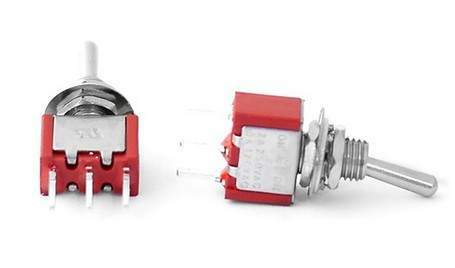 The physical size of the pushbutton is the same as all of the other switches - only the rectangular body of the switch is smaller for more compact spaces. Note: With momentary switches, it is necessary to check the pins with a meter and determine the normally open and normally closed pins, comparing to the original switch and design before wiring. Otherwise, it is possible to install a momentary switch "backwards" (reversed 180 degrees) and the device will not work properly. 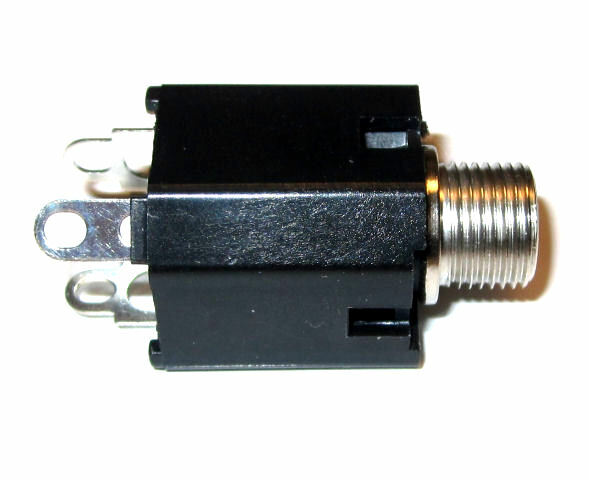 Smaller body than the FS-498-PC, this switch is used in many Dunlop®/MXR® stomp boxes. Used in later revisions of the MXR® Micro Amp, Carbon Copy, and others. Also used in the later CSP101SL and M101 versions of the MXR® Phase 90, MXR® M107 Phase 100, MXR® Dime Distortion, MXR® Bass Octave Deluxe, MXR® Custom Badass Modified O.D., MXR® Custom Badass 78 Distortion, MXR® Bass Distortion, MXR® Bass Envelope Filter, MXR® Bass Fuzz Deluxe, MXR® Bass Compressor, MXR® Fullbore Metal, MXR® M117R Flanger, MXR® Supercomp, MXR® Microamp, MXR® M134 Stereo Chorus, MXR® M135 SmartGate, MXR® M148 Micro Chorus, M169 Carbon Copy . Dunlop® part number ECB554. 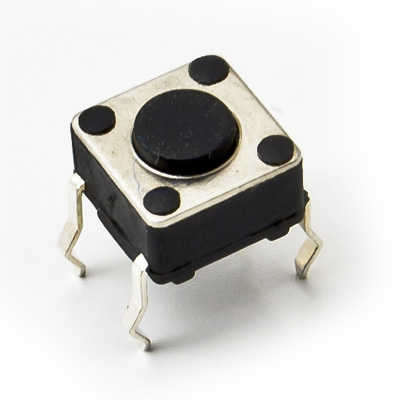 The physical size of the pushbutton is the same as all of the other switches - only the rectangular body of the switch is smaller for more compact spaces. This is a "firm-click" switch - not a momentary. Switch is marked "L" on the side (for locking). 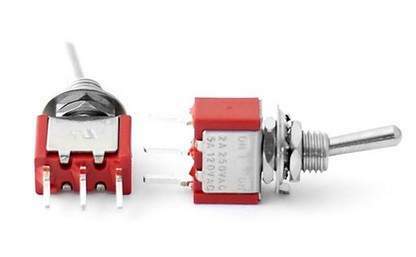 This switch is NOT the same as the FS-211-PC switch - the D-ECB554 is an extended length switch for Dunlop®® / MXR® pedals only. 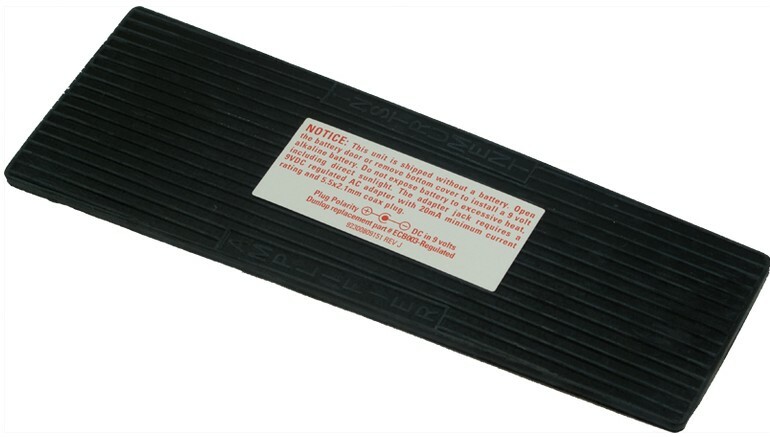 Original replacement part for Dunlop® 105Q Crybaby Bass Wah and Dunlop® 95Q Crybaby Q-Wah. FOOT SWITCH, DPDT, MOMENTARY, FOR SWITCHING AND EFFECTS. 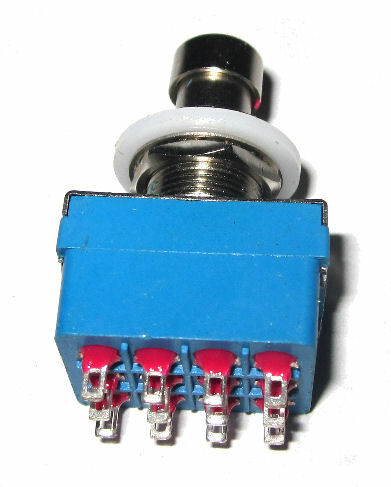 Made for switching and effects units which require a momentary connection rather than a "hard" connection (no "click"). Solder lugs for wire. This is a soft-click momentary switch. Note: With momentary switches, it is necessary to check the pins with a meter and determine the normally open and normally closed pins, comparing to the original switch and design before wiring. Otherwise, it is possible to wire a momentary switch "backwards" (reversed 180 degrees) and the device will not work properly. Important: This is one of two types of momentary 3-pin SPDT footswitches using the same footprint. Click on the diagram to the left, compare the switching with your requirements. The other switch is the FS-602-PC, with the opposite switching logic. Customer is responsible for testing and selecting the switch with the correct switching logic - Studio Sound Electronics is not responsible if the wrong switch is selected. Made for switching and effects units which require a momentary connection rather than a "hard" connection (no "click"). PC terminals. Soft-click momentary. Has 3 terminals. Important: This is one of two types of momentary 3-pin SPDT footswitches using the same footprint. Click on the diagram to the left, compare the switching with your requirements. The other switch is the FS-502-PC, with the opposite switching logic. Customer is responsible for testing and selecting the switch with the correct switching logic - Studio Sound Electronics is not responsible if the wrong switch is selected. Made for switching and effects units which require a momentary connection rather than a "hard" connection (no "click"). PC terminals. Has 3 terminals. 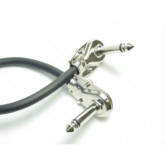 Used in the 5-way foot controller on the Marshall® TSL-100 amps for the clean, crunch and lead switches. Soft-click momentary. larger view FOOT SWITCH, DPDT, MOMENTARY, FOR SWITCHING AND EFFECTS. Made for switching and effects units which require a momentary connection rather than a "hard" connection (no "click"). Soft-click momentary, PC terminals. 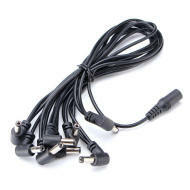 Used in the 5-way foot controller on the Marshall® TSL-100 amps for the reverb and effects switches. 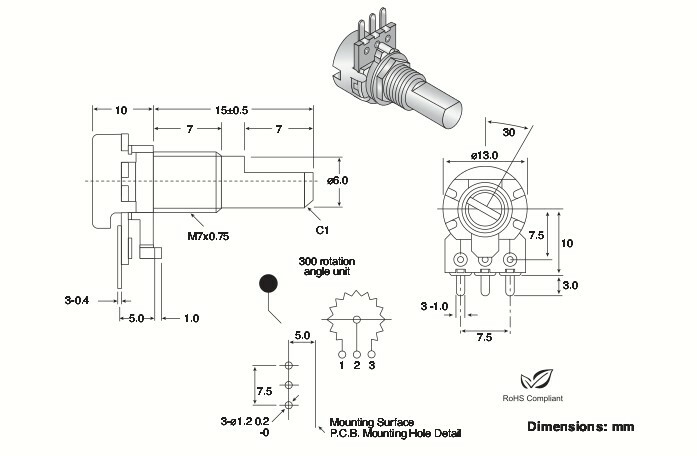 Marshall® Part number SWTP-00047. Also fits some Blackstar® HT Dual Footpedals. Blackstar® part #MCSWH02014. Note: With momentary PC Mount switches, it is necessary to check the pins with a meter and determine the normally open and normally closed pins, comparing to the original switch and design before installing. 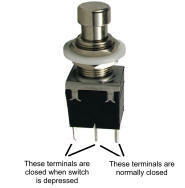 Otherwise, it is possible to install a momentary switch "backwards" (reversed 180 degrees) and the device will not work properly. 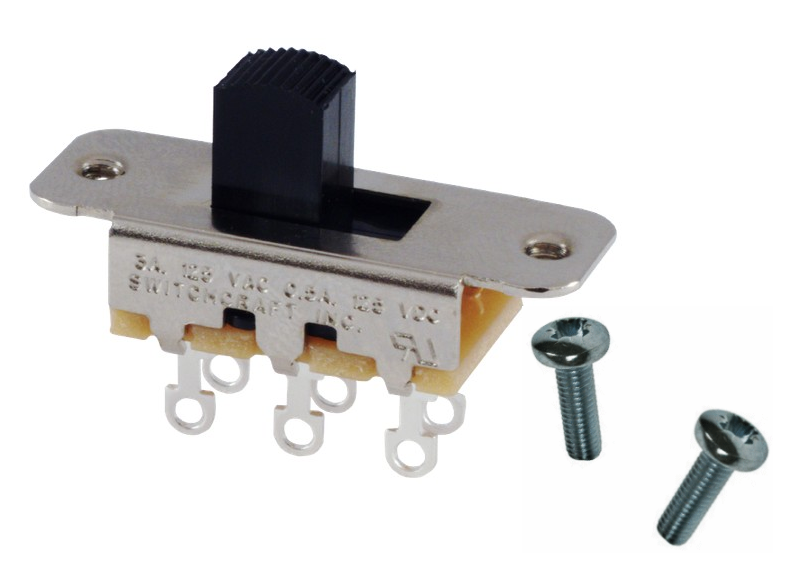 FOOT SWITCH, 3PDT, SOLDER LUGS, LATCHING, FOR SWITCHING AND EFFECTS. Has 9 electrical terminals (3 pole, double throw). Commonly found in effects pedals which have "true bypass". Solder lugs for wire. 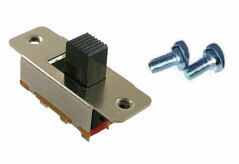 larger view FOOT SWITCH, 3PDT, PC MOUNT, LATCHING, FOR SWITCHING AND EFFECTS. Has 9 electrical terminals (3 pole, double throw) Commonly found in effects pedals which have "true bypass". Made for PC mounting. 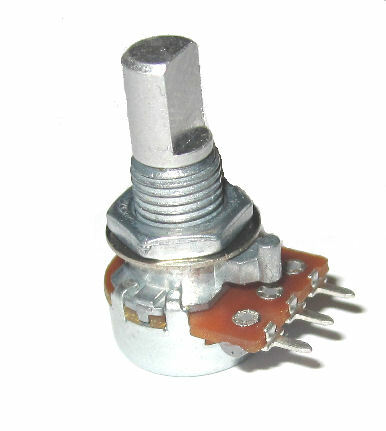 larger view FOOT SWITCH, 4PDT, SOLDER LUGS, LATCHING, FOR SWITCHING AND EFFECTS. Has 12 electrical terminals (4 pole, double throw) For use in effects pedals which have "true bypass". Solder lugs for wire. Four poles allow additional features and switching options for your own design, such as additional LED indicators in addition to "true bypass". With 4PDT, the options you can create in switching are limited only by your imagination! Replacement for Boss effects pedals, SPST momentary, push switch. Mounts in square hole approximately .55" x .55" x 1.08" overall length including terminals. Common switch found in Line 6 floor pedals (such as the Pod XT Live, DL4), Digitech floor controllers (such as the Control ONE), older DOD pedals, and Marshall JVM series footswitch boxes. 12mm x 12mm (about 1/2" x 1/2" x 1/4" tall). Line 6 part number 24-31-0100. Fits the following: Boss ME-5. Casio CZ-1000, CZ-3000, CZ-5000. Ibanez TS9 Tube Screamer. Kawai K3, Korg DW Series, EX-8000, KPR-77, Poly-61. Kurzweil K1000, K1200, K2000. Roland Axis-1, FC-100, GR-700, JX-8P, PG-800, TB-303, TR-606. Yamaha DX7, DX9, KX88. Oberheim Matrix 6/6R/1000. Sequential Circuits Multi-Trak. Boss part # 13129715. Korg # 37505000. Roland # 13129715. Yamaha # KA905510. 12mm x 12mm (about 1/2" x 1/2"). Height of switch from under the base to the top of the plunger is about 7mm. Data Sheet here. 6mm x 6mm square (¼" x ¼"). Body of switch is 3.0mm tall (without plunger). Plunger extends 1.0mm above top of switch (about the thickness of a credit card). Used in effects pedals, front panel controls, etc. 4 legs (2 of them are redundant on each side, so the switch is SPST, normally open, momentary). For through-the-hole mounting on PC boards. 6mm x 6mm square (¼" x ¼"). Body of switch is 3.0mm tall (without plunger). 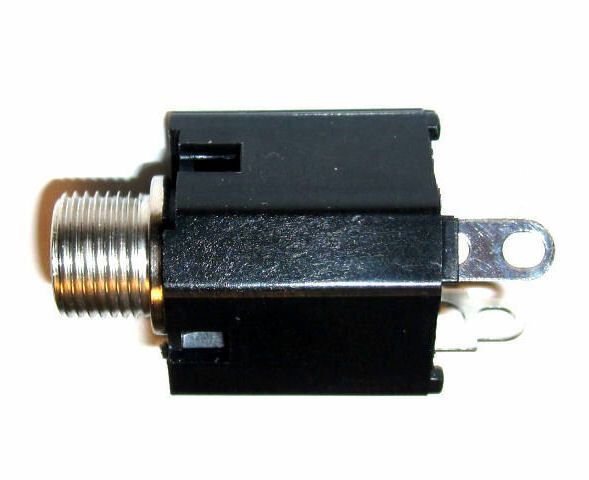 Plunger extends 1.5mm above top of switch. Used in effects pedals, front panel controls, etc, including some Boss® products. 2 legs, SPST, normally open, momentary. For through-the-hole mounting on PC boards. 6mm x 6mm square (¼" x ¼"). Body of switch is 3.0mm tall (without plunger). 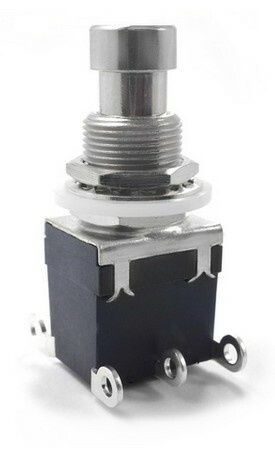 Plunger extends 6.0mm above top of switch. Used in effects pedals, front panel controls, etc, including some Boss® products. 2 legs, SPST, normally open, momentary. For through-the-hole mounting on PC boards. larger view SWITCH, SLIDE, SWITCHCRAFT®, DPDT (6 TERMINALS) Used in some Electro Harmonix AC powered effects pedals, such as the Memory Man. Also used as the slide switch on Jazzmaster and Jaquar guitars. Click here for physical specifications. Two screws are included with the switch. 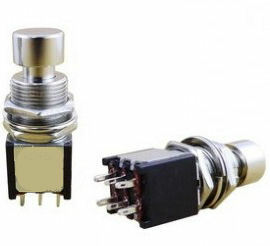 larger view SWITCH, SLIDE, DPDT (6 TERMINALS), MADE BY ALPHA (TAIWAN) Used in some Electro Harmonix AC powered effects pedals, such as the Memory Man. Click here for physical specifications. Two screws are included with the switch. larger view SWITCH, MINI SPDT TOGGLE, USED IN GUITARS FOR SPECIALTY PICKUP SWITCHING (COIL TAP, ETC.). ALSO USED IN SOME ELECTRONICS GEAR (EFFECTS, ETC) SOLDERED WIRE TYPE TERMINALS. ON-ON SWITCHING (NO CENTER OFF POSITION). larger view SWITCH, MINI SPDT TOGGLE, PC BOARD TERMINALS ON-ON SWITCHING (NO CENTER OFF POSITION). Same as the SW-MTS-S11 above, except designed for PC board insertion. larger view SWITCH, MINI SPDT TOGGLE, USED IN GUITARS FOR SPECIALTY PICKUP SWITCHING (COIL TAP, ETC.). ALSO USED IN SOME ELECTRONICS GEAR (EFFECTS, ETC) SOLDERED WIRE TYPE TERMINALS. ON-OFF-ON SWITCHING (CENTER OFF POSITION). Same as the SW-MTS-S101 above, except designed for PC board insertion. larger view SWITCH, MINI DPDT TOGGLE, USED IN GUITARS FOR SPECIALTY PICKUP SWITCHING (COIL TAP, ETC.). ALSO USED IN SOME ELECTRONICS GEAR (EFFECTS, ETC) SOLDERED WIRE TYPE TERMINALS. ON-ON SWITCHING (NO CENTER OFF POSITION). larger view SWITCH, MINI DPDT TOGGLE, PC BOARD TERMINALS ON-ON SWITCHING (NO CENTER OFF POSITION). Same as the SW-MTS-D11 above, except designed for PC board insertion. larger view SWITCH, MINI DPDT TOGGLE, USED IN GUITARS FOR SPECIALTY PICKUP SWITCHING (COIL TAP, ETC.). ALSO USED IN SOME ELECTRONICS GEAR (EFFECTS, ETC) SOLDERED WIRE TYPE TERMINALS. ON-OFF-ON SWITCHING (WITH CENTER OFF POSITION). Same as the SW-MTS-D101 above, except designed for PC board insertion. Has 2 electrical terminals on back of switch. 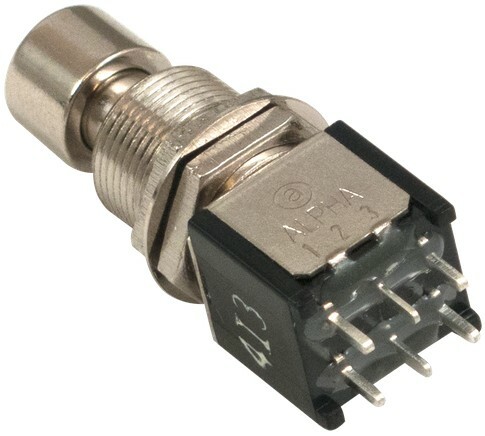 1/4" push-on terminals, or solder directly to terminals. Rated 15A @ 125VAC, 10A @ 250VAC. Rocker is colored red. Does NOT have an internal light. Designed for 1 1/8" x 9/16" rectangular mounting hole. 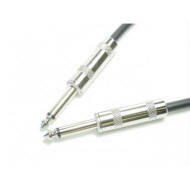 Used in several brands of amplifiers and effects as the main power switch. 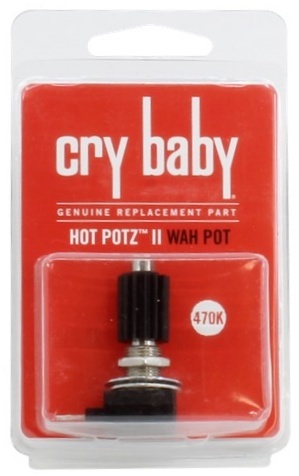 The Jim Dunlop ECB24B Hot Potz II 100K Potentiometer is a replacement for Dunlop Crybaby wah pedals. Features super long life and is sealed to keep all dirt, grime and grease out of the pot. 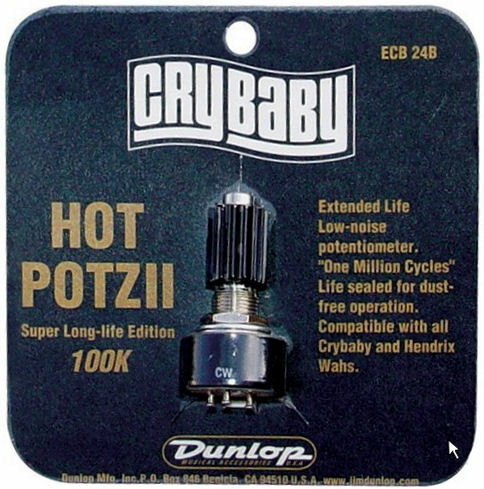 The Jim Dunlop ECB24B Hot Potz 470K Potentiometer is a replacement for Dunlop Jimi Hendrix Crybaby wah pedals and the GCB80 High Gain Volume Pedal. Features super long life and is sealed to keep all dirt, grime and grease out of the pot. Smooth operation, very similar to original pots as used in the Dunlop® and Vox® pedals. Replacement pot for Dunlop®, Vox, etc., Wah pedals with gear & rack operation. Nut and washers included. 100K as used in most wah pedals. (Note - not for pedals where the control pot is PC board mounted, such as the Crybaby 535Q.) Soldering is required to install this replacement pot. Unlike the original sealed pot (or the replacement sealed Hot Potz), this pot has a slot where cleaning fluid may be sprayed. larger view Dunlop® RUBBER FEET, SET OF 4. Made for Dunlop® Crybaby and Vox® Wah pedals, and other applications where small rubber feet are needed. Screws included. Rubber feet are 5/8" diameter x 1/4" tall. 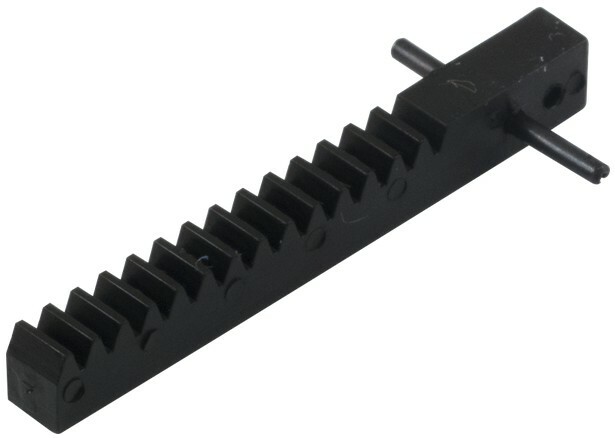 Original Dunlop® replacement rack for wah pedals (roll pin included : 0.77" length x 0.07" diameter - for mounting the rack to the treadle). The rack has 14 teeth and mounts to the underside of the treadle piece (rocking structure) of a wah pedal. The teeth of the rack interlock with the teeth of the wah potentiometer gear (i.e. pinion), thereby rotating the potentiometer shaft as the treadle is rocked back and forth. 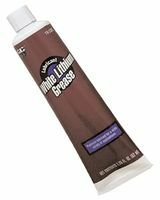 GC Electronics white lithium grease - lubricant used on rack, control pot gear, and on the rack clamp. Large 1 3/4 oz tube - good for dozens of other household lubrication jobs. Also used in VCRs, cassette decks, turntables and more. Sold only in the United States. 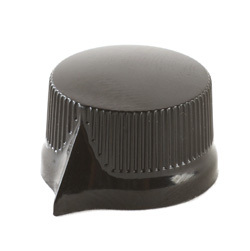 larger view Dunlop®® Replacement rubber grommets for many models of Dunlop® Wah pedals. Commonly, two front bumpers are fastened underneath the toe-end of the treadle and one rear bumper is fastened underneath the heel-end of the treadle. Alternate bumper heights allow you to customize the fit and feel when stepping into the footswitch or rocking back to a maximum open treadle position. larger view BOTTOM PLATE WITH BATTERY DOOR AND CLIP, Dunlop®® Bottom Plate with Battery Box for GCB-95. Original Dunlop® replacement part. Includes the D-ECB244 battery box (above) and 4 rubber feet. Original Crybaby replacement circuit board for pedals made after 1990 (GCB-95). Contains sought-after red Fasel inductor. Original Dunlop® replacement part. Note: Does not fit the very latest CryBaby version - the GCB-95F (Version F). The Fasel inductor is back! 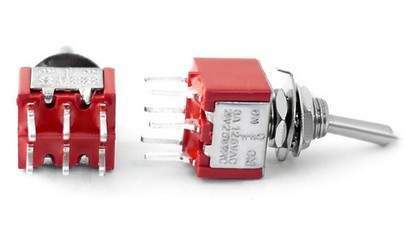 These near-mythical inductors are the key to the singing tonal sweep every wah player lusts for but is unable to capture with a new pedal. The ultimate upgrade to your current wah, these magic bullets are available exclusively from Dunlop®, the new worldwide agent for Fasel of Italy. Your wah will finally give up the lush harmonic sparkle you have always heard in your head but could never coax from you rig. The yellow inductor is designed to give the vintage vibe sound. Use the red inductor for the cleanest sound possible. The Fasel inductor is back! These near-mythical inductors are the key to the singing tonal sweep every wah player lusts for but is unable to capture with a new pedal. The ultimate upgrade to your current wah, these magic bullets are available exclusively from Dunlop®, the new worldwide agent for Fasel of Italy. Your wah will finally give up the lush harmonic sparkle you have always heard in your head but could never coax from you rig. The red inductor is designed to give the cleanest sound possible. Use the yellow inductor for the vintage vibe sound. Exclusive Dunlop® jack - used in several MXR® pedals. Has additional off-normal contact on the ring conductor. Chrome nut is included. The two most common connectors for AC Adapters are 2.1mm x 5.5mm and 2.5mm x 5.5mm. 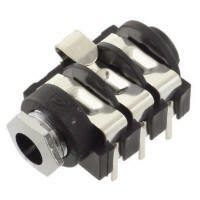 The outside diameter of these connectors are identical, but one uses a larger pin than the other, and therefore they are not compatible. This Adapter has a 2.1mm pin in the back, with a 2.5mm hole in the front, for cases where the pin in your pedal is just a tiny bit too large for the Adapter. 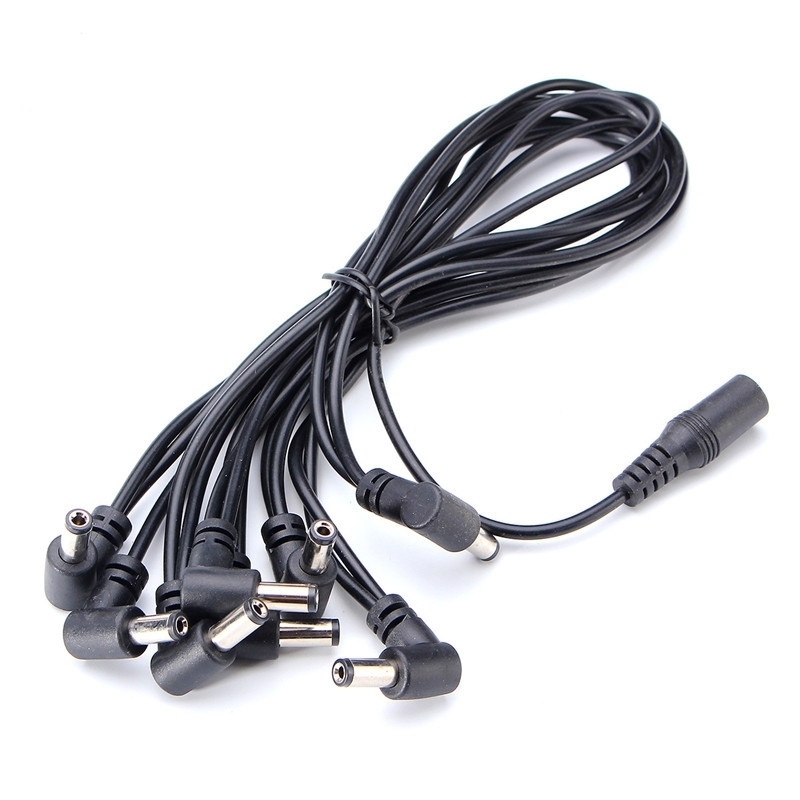 The two most common connectors for AC Adapters are 2.1mm x 5.5mm and 2.5mm x 5.5mm. 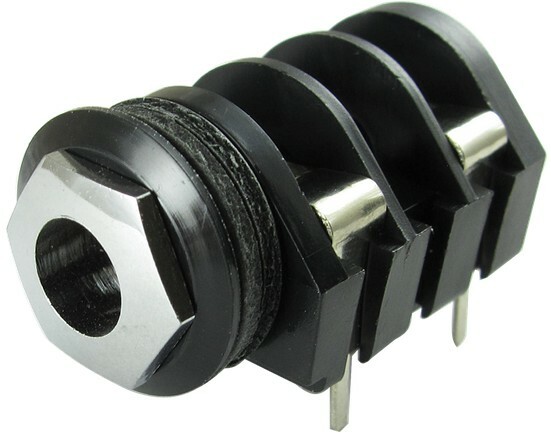 The outside diameter of these connectors are identical, but one uses a larger pin than the other, and therefore they are not compatible. 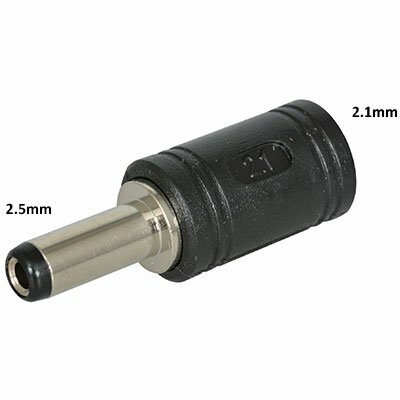 This Adapter has a 2.5mm pin in the back, with a 2.1mm hole in the front, for cases where the pin in your pedal is just a tiny bit too small for the Adapter connector, and your power is intermittent when you move the Adapter cable. Low-noise 5532 Dual Op-Amp in 8-pin DIP package. Low-noise 5534 Single Op-Amp in 8-pin DIP package. Low-noise 2068 Dual Op-Amp in 8-pin DIP package. Op-Amp, switchable, used in Marshall® and Kustom amps. 8-pin DIP. Improved replacement for 2120D, M2120, or M5201. This chip has a higher slew rate and increased bandwidth product as compared with the original op-amps. The original versions have been phased out of production. Op-Amp, very low offset voltage. Used in some effects pedals, such as the ProCo RAT. 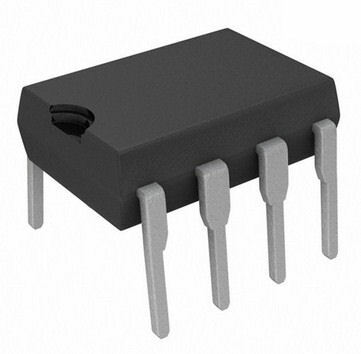 Low-current, JFET input, TL062 Dual Op-Amp in 8-pin DIP package. 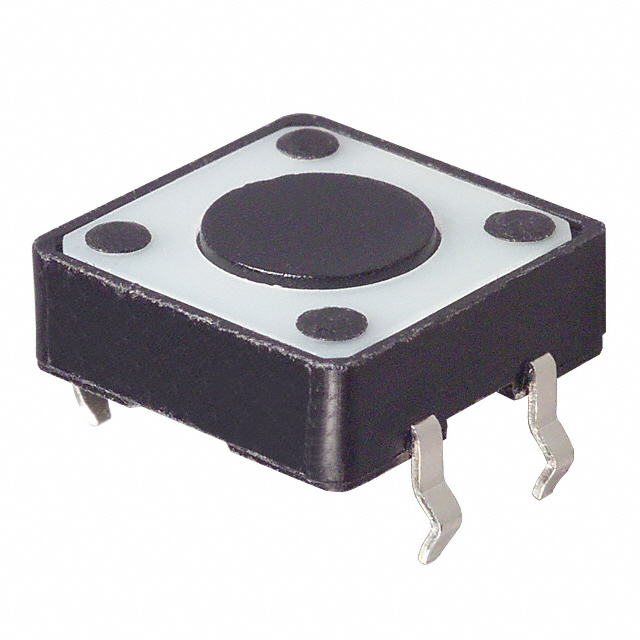 Compatible with TL072 designs, with significantly lower current draw. Good choice for battery-operated pedals to increase battery life. Low-noise, JFET input, TL071 Single Op-Amp in 8-pin DIP package. Also TL071CN. Low-noise, JFET input, TL072 Dual Op-Amp in 8-pin DIP package. Also TL072CN. 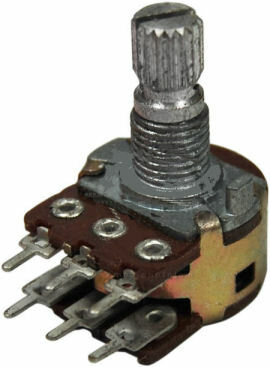 QUAD IC SWITCH, used in certain Marshall® amps, including some of the ValveState models. 16 Pin DIP. 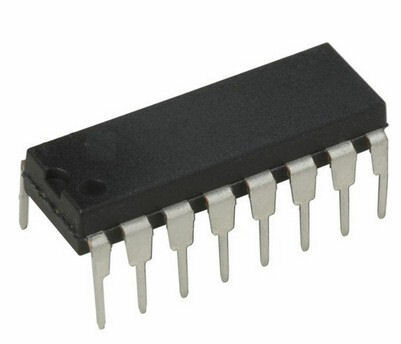 4808-3004 From the 3M Company ... 8-pin DIP socket, fits all of the 8-pin op-amps above. We recommend installing a socket first whenever you replace an op-amp - it makes future repairs much quicker and easier! 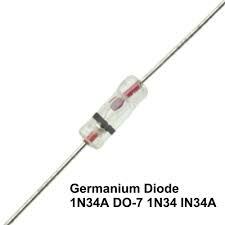 1N34A GERMANIUM DIODE Popular in distortion pedals for signal clipping at lower forward voltage. Peak reverse voltage 45VDC. Reverse voltage 20V. Peak forward current 150mA. DO-7 glass case. Used to interconnect circuit boards in a variety of amps. • May be easily cut with an X-Acto knife to make a cable of fewer than 10 conductors. • Not recommended for use in the Fender Hot Rod Deluxe / Deville or Blues Deluxe / Deville. The ribbon cables used in those amps have ribbon cables with conductors set at 0.156" spacing - this cable is too narrow for that application. German craftsmanship in a compact 1/4" jack. Mono, open circuit. Perfect for tight fits in pedals. German craftsmanship in a compact 1/4" jack. Stereo, open circuit. Perfect for tight fits in pedals. Commonly used as the input jack in many pedals. Found in many guitars, effects pedals, amps speaker output. Includes nut and washer. Same as the J-11 jack, but with longer (3/8") threaded bushing for mounting in thicker panels. Includes nut and washer. Same as the Switchcraft L11 but includes fiber isolation washers. The isolation washers keep the jack from making contact with your chassis. This leaves the jack ungrounded which is needed in certain applications. Found in vintage Fender® (and other) amps as the input jack. Also used in the Hot Rod Deluxe/Deville, Blues Deluxe/Deville as the main speaker out jack. Includes nut and washer. Fender® part number 0021550000 (originally 021550). Same as the J-12A jack, but with longer (3/8") threaded bushing for mounting in thicker panels. Includes nut and washer. Same as the Switchcraft L12A jack but includes a set of isolation washers. The isolation washers keep the jack from making contact with your chassis. This leaves the jack ungrounded which is needed in certain applications. Commonly used in older Fender® Hot Rod Deluxe/Deville and Blues Deluxe/Deville amps to replace the fragile input jacks. 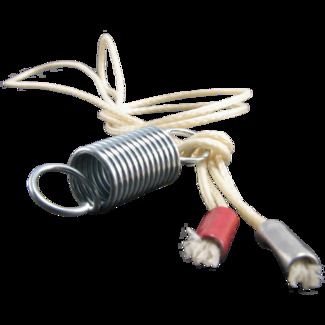 Used with T/R/S plugs for either balanced connections or stereo connections. Also very common in guitars with active pickups, and as the input jack on some effects pedals. The ring conductor is used in these cases to "turn on" the battery by tying one leg of the battery to ground via the plug. Same as the J-12B jack, but with longer (3/8") threaded bushing for mounting in thicker panels. Includes nut and washer. larger view JACK, 1/4", TIP/RING/SLEEVE, WITH TIP SHUNT. Switchcraft 13B Jack. Tip/Ring/Sleeve Switchcraft jack. Tip has a shunt contact, ring contact is open circuit. Pair of fiber insulating shoulder washers for Switchcraft jacks with metal bushings. Used to mount standard jacks in a 1/2" diameter chassis hole, while insulating the metal bushing (ground) of the jack from the chassis. ID 3/8", OD 1/2". 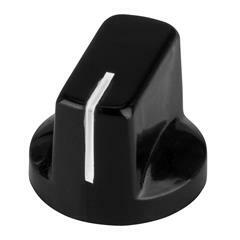 Works great when replacing isolated plastic jacks with a more durable metal jack, which is frequently done on the input jacks of the Fender® Hot Rod Deville/Deluxe and Blues Deville/Deluxe. Two washers are used on each jack, and the "shoulders" are placed facing each other through the chassis. The washers not only isolate the ground of the jack electrically for noise reduction, but also stabilize the jack in the 1/2" diameter hole. Jack shown in picture NOT included. Works well with the Switchcraft J-11, J-L11, J-12A, J-L12A, J-12B, J-L12B, J-13, J-13A, J-112APC, J-112BX, J-114BX, J-521 and J-524 jacks. 5 PIN MIDI CONNECTOR, PCB Female, right angle. 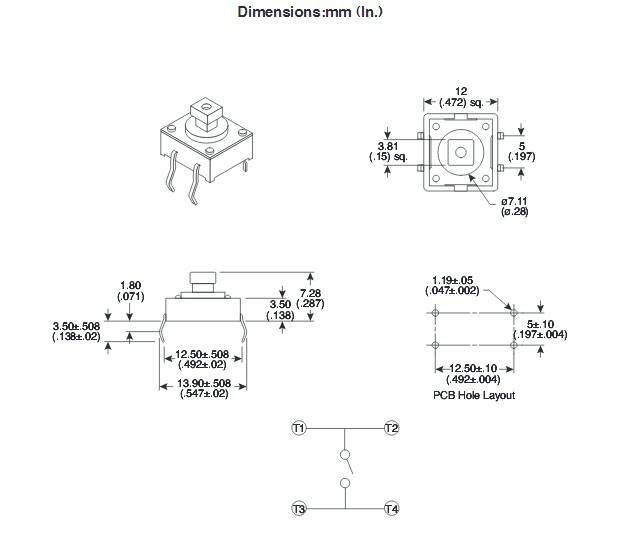 Pin spacing 2.54mm (0.1"). 2A 100VAC - 1A 24VDC. Often found in keyboards, rack mount MIDI-controlled processors, etc. Common input jack in guitars, hand-wired effects pedals. 2 pins T/S, open circuit, non-switched. Nut and washer included. Common input jack in guitars, hand-wired effects pedals. 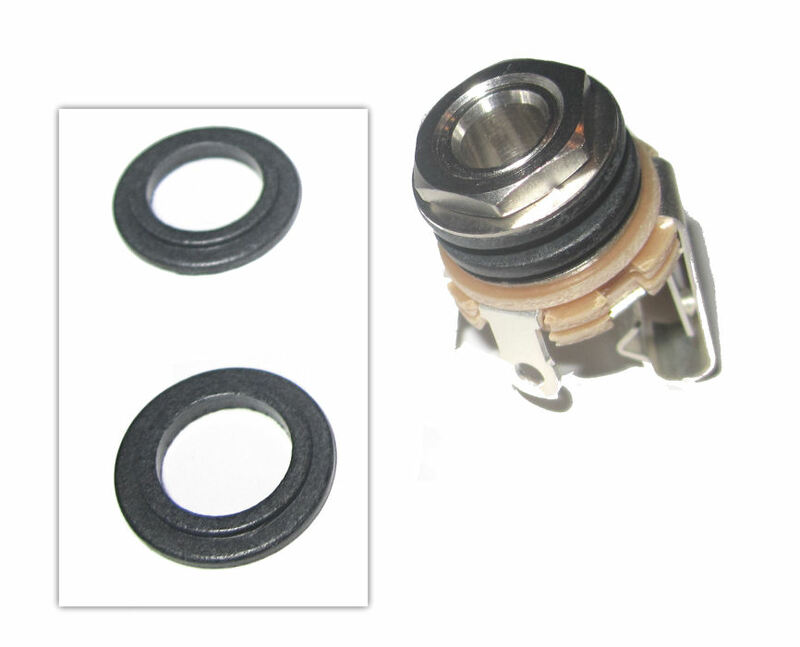 2 pins T/S, open circuit, non-switched, nylon bushing for ground isolation. Nut and washer included. Common input jack in guitars, hand-wired effects pedals. 3 pins T/R/S, open circuit, non-switched. Nut and washer included. Common input jack in guitars, hand-wired effects pedals. 3 pins T/R/S, open circuit, non-switched, nylon bushing for isolation. Nut and washer included. Common input jack in guitars, hand-wired effects pedals. T/R/S closed circuit, switched, metal bushing, 5 pins for wiring. Nut and washer included. Tip is switched (normally closed), ring conductor is not switched. 4 pins for wiring, metal bushing. 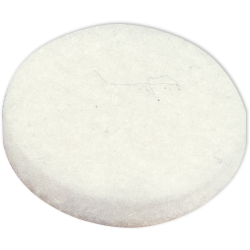 Used in DOD® and other brands. Nut and washer included. Common input jack found in some "boutique" and independent brand amps, as well as Marshall® . NOT used in Crate®, Ampeg®. 4 PC board terminals. 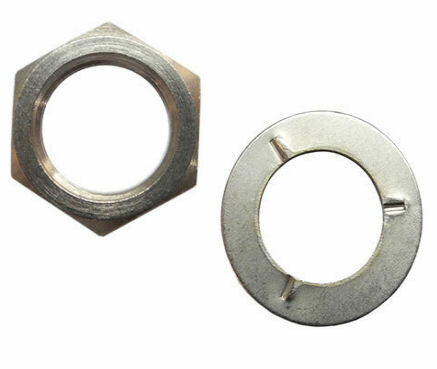 Chrome nut has male threads, jack has female threads. Leads from jack come straight down from the contacts to go into the PC board. With nut and washer. 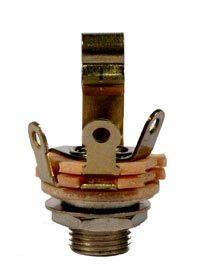 Common input jack found in some "boutique" and independent brand amps, as well as Marshall® and Dunlop®®/MXR® products. NOT used in Crate®, Ampeg® (see J-581L for those). 6 PC board terminals. Chrome nut has male threads, jack has female threads. Leads from jack come straight down from the contacts to go into the PC board. With nut and washer. 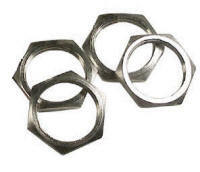 Genuine Switchcraft® nut and washer set for the blackface/silverface Fender® bias pot, Mesa Boogie pots, and the CTS or Alpha pots with 3/8" bushing (found on original vintage Fender® blackface and silverface), as well as Peavey® and Switchcraft® 1/4" jacks. Does NOT fit the 24mm Marshall® pots. 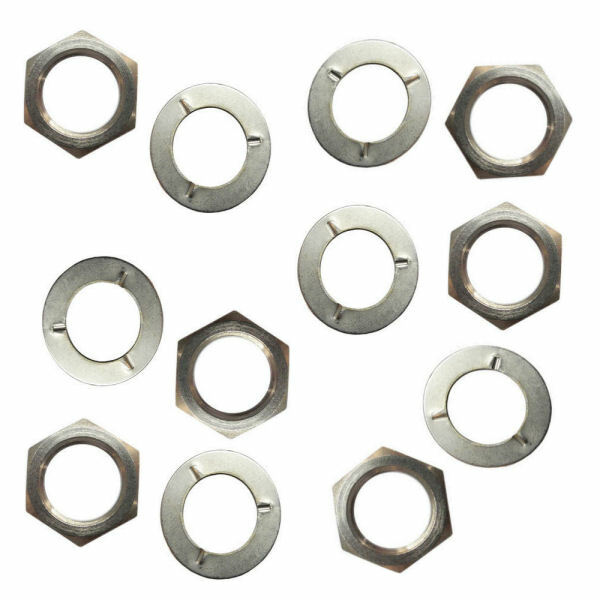 Set of 6 washers and 6 nuts. 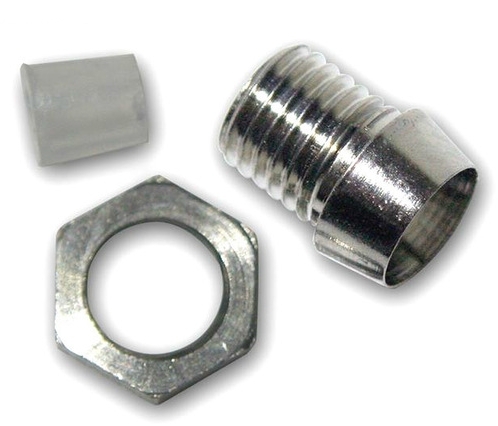 Genuine Switchcraft® nut and washer set for the blackface/silverface Fender® bias pot, Mesa Boogie pots, and the CTS or Alpha pots with 3/8" bushing (found on original vintage Fender® blackface and silverface), as well as Peavey® and Switchcraft® 1/4" jacks. Does NOT fit the 24mm Marshall® pots. 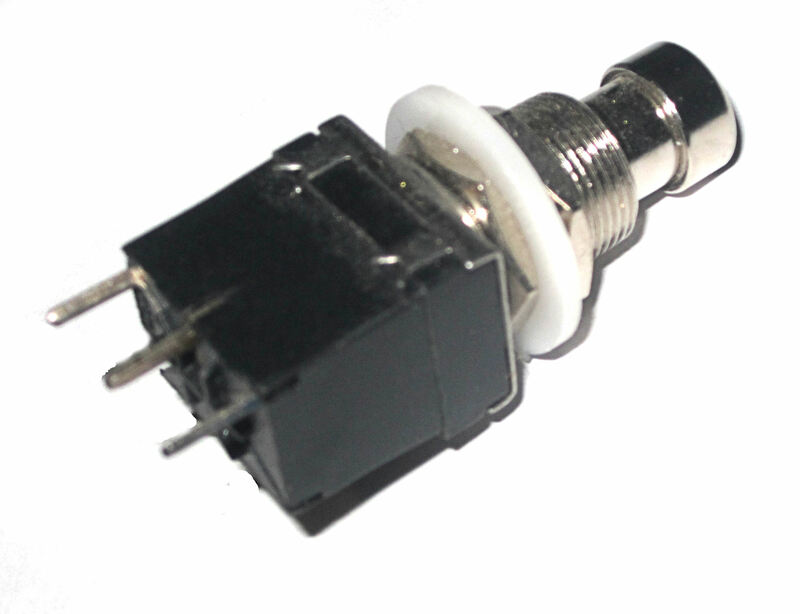 Replacement Barrel DC power jack for many pedals, keyboards, etc which use a PC board mounted DC power jack. Connector fits the popular 2.1mm x 5.5mm barrel plug found on many Adapters. Normally closed switch, so that an internal battery may be switched on or off automatically as the Adapter is connected. 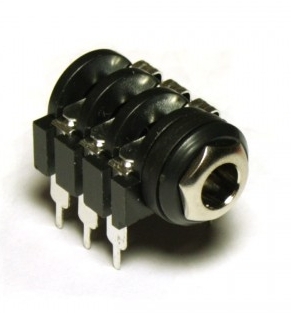 Plastic housing isolates both conductors, so it may be used for either center positive or center negative Adapters. Small size 0.78" (20mm) diameter, 0.43" (11mm) tall, fits smooth 1/4" shaft. Silver top is ridged, similar to the cap on a Marshall knob. Classic look found on Boss FX units. With set screw. 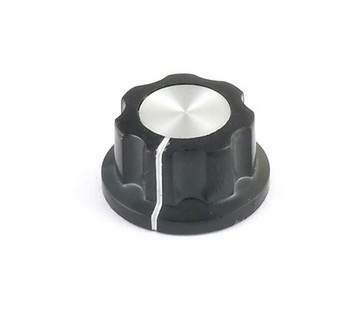 Medium size 0.91" (23mm) diameter, 0.5" (12mm) tall, fits smooth 1/4" shaft. Smooth silver top. Classic look found on Boss FX units. With set screw. Large size 1.06" (27mm) diameter, 0.6" (15mm) tall, fits smooth 1/4" shaft. Smooth silver top. Classic look found on Boss FX units. With set screw. Reproduction of the small 1900H Davies knob. Looks great on pedals. 1/4" Shaft, Size-Diameter 12.7mm, height 15.9mm, With Set Screw. Reproduction of the small 1900 Davies knob. Looks great on pedals. 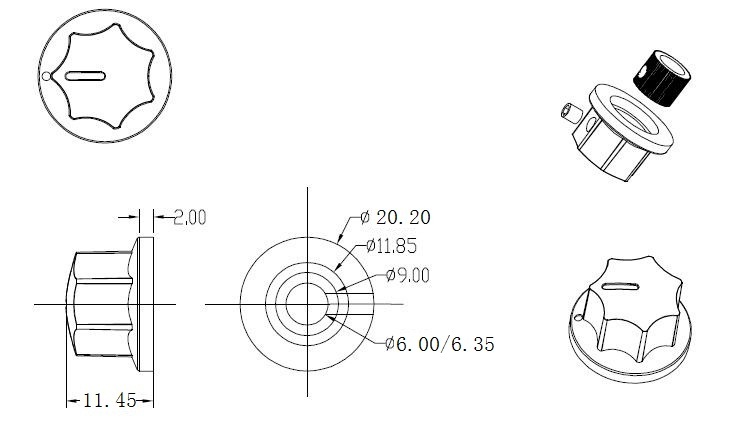 1/4" Shaft, Size-Diameter 12.7mm, height 15.9mm, push-on, for knurled-shaft pots. 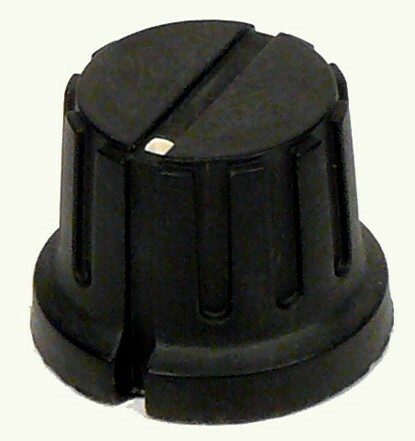 Original Dunlop® MXR® Knob - as used on the Phase 90 and other MXR® pedals. 1" diameter x 0.6" high. 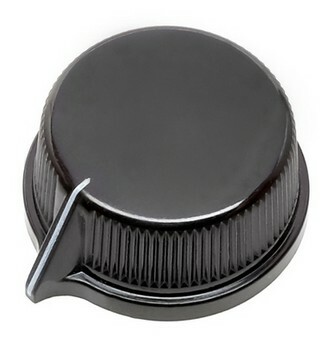 Original Dunlop® MXR® Knob Cover - as used on the Phase 90 and other MXR® pedals. larger view DAVIES STYLE 1400 REPRODUCTION KNOB. Replaces the Dunlop® ECB245 knob. Small knob, 11/16" diameter x 13/32" high. 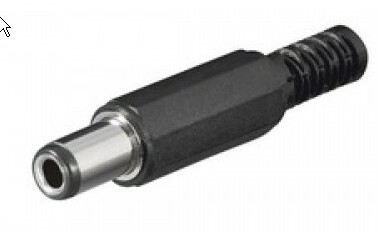 For 1/4" smooth shaft - with set screw. larger view DAVIES STYLE 1470 REPRODUCTION KNOB. Used on a number of classic effects pedals. Larger knob, 1" diameter (at the base) x 1/2" high. Pointer extends about 3mm beyond the outside rim of the knob. 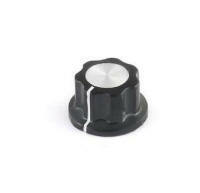 Black thermoset plastic, for 1/4" smooth shaft - with brass set screw. 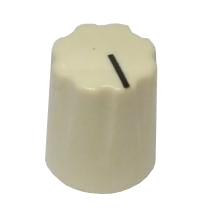 larger view KNOB, Medium, Cream with Black Line Indicator. Push-on, for knurled shaft pots (no set screw) Great effects pedal knob. 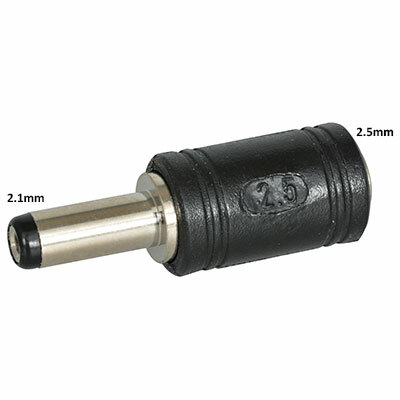 0.75" diameter, 0.575" tall (19mm x 15mm) Designed for push-on knurled 1/4" pot shafts (no set screw). 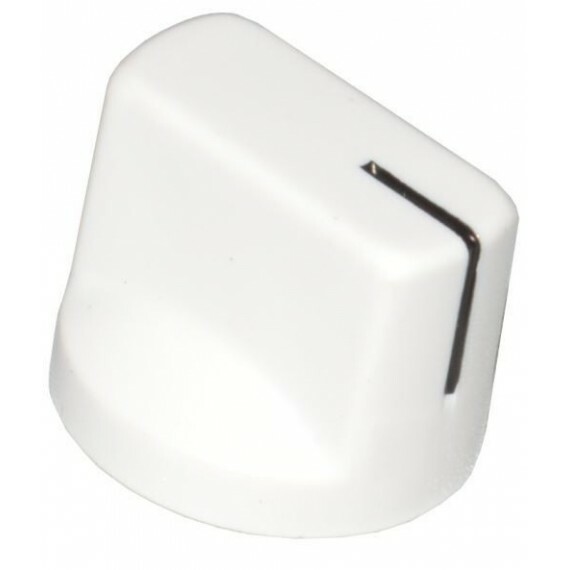 larger view KNOB, Medium, White with Black Line Indicator. 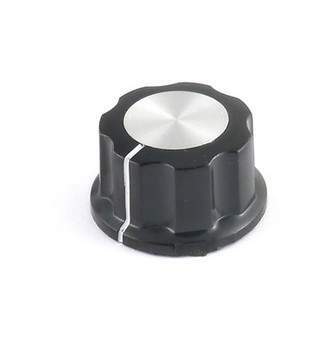 Push-on, for knurled shaft pots (no set screw) Great effects pedal knob. 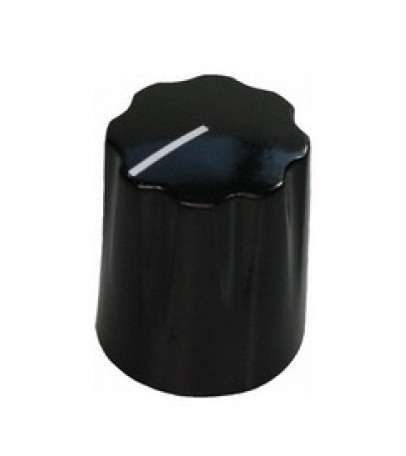 0.75" diameter, 0.575" tall (19mm x 15mm) Designed for push-on knurled 1/4" pot shafts (no set screw). 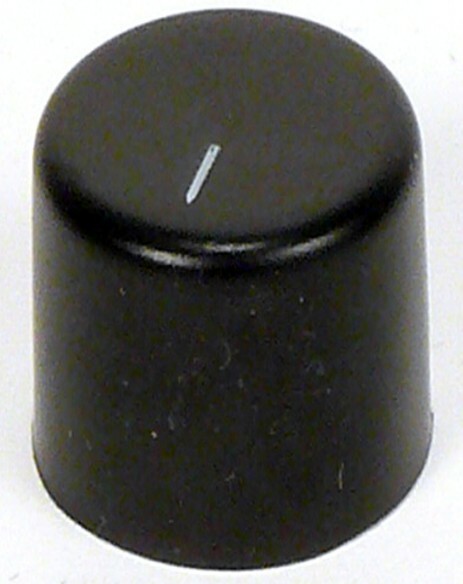 larger view KNOB, Electro-Harmonix®, Black with Cross Slot and White Dot Indicator 1/4" smooth shaft, with set screw. General control knob, fits all current EH pedals, plus a variety of other applications. 0.80" wide at the base, 0.62" wide at the top, 0.61" tall. larger view KNOB, Electro-Harmonix®, Large Black with White Line Indicator Push on for 1/4" Knurled Shaft. Used on many current EH pedals, plus a variety of other applications. 1.00" wide, 0.62" tall. larger view KNOB, Electro-Harmonix®, Small Black with White Line Indicator Push on for 1/4" Knurled Shaft. Used on many current EH pedals, plus a variety of other applications. 0.66" wide, 0.53" tall. larger view POT, BOOST OR "Q" CONTROL, DUNLOP 535Q and 95Q. larger view POT, PC MOUNT, 16mm DIAMETER BODY, 7mm DIAMETER THREADED BUSHING, MEDIUM SHAFT (10mm LONG). larger view POT, 1 MEG OHM X2 LINEAR DUAL, (B1M), PC MOUNT, 6 MOUNTING PINS, 16mm DIAMETER BODY, 7mm DIAMETER THREADED BUSHING, MEDIUM SHAFT. 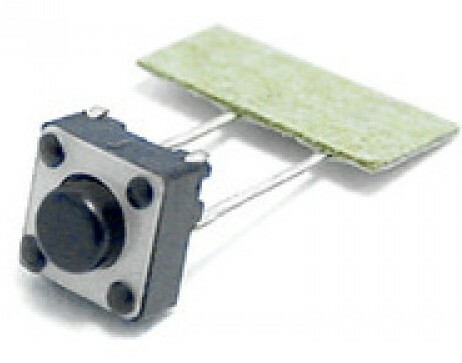 Used in many amp models with PC board circuitry. Diameter of the body of the pot is slightly smaller than a dime. Shaft length is 10mm. Exact replacement for the volume control pots (both channels) on the Orange Dual Terror Amp. larger view POT, PC MOUNT, 16mm DIAMETER BODY, 7mm DIAMETER THREADED BUSHING, SHORT SHAFT (6.5mm LONG). larger view POT, DUAL 50K OHM LINEAR, (B50K), PC MOUNT, 16mm DIAMETER BODY, 7mm DIAMETER THREADED BUSHING, SHORT SHAFT. larger view POT, 5K LINEAR, (B5K), PC MOUNT, 13mm DIAMETER BODY, 7mm DIAMETER THREADED BUSHING, SHORT D-STYLE FLATTED 1/4" SHAFT. larger view POT, 100K LINEAR, (B100K), PC MOUNT, 13mm DIAMETER BODY, 7mm DIAMETER THREADED BUSHING, SHORT D-STYLE FLATTED 1/4" SHAFT. larger view POT, 500K LINEAR, (B500K), PC MOUNT, 13mm DIAMETER BODY, 7mm DIAMETER THREADED BUSHING, SHORT D-STYLE FLATTED 1/4" SHAFT. larger view POT, 50K AUDIO TAPER, (A50K), PC MOUNT, 13mm DIAMETER BODY, 7mm DIAMETER THREADED BUSHING, SHORT D-STYLE FLATTED 1/4" SHAFT. larger view POT, 500K AUDIO TAPER, (A500K), PC MOUNT, 13mm DIAMETER BODY, 7mm DIAMETER THREADED BUSHING, SHORT D-STYLE FLATTED 1/4" SHAFT. INCLUDES NUT & WASHER. (For spare or replacement nut, order the JN-1018 nut found in this section). Made by Alpha. This kit replaces the cord and spring in your Ernie Ball volume pedal. This kit is for the Ernie Ball VP Jr Junior-Size volume pedals, including the models 6180 and 6181 pedals. Instructions included. Not responsible for web site errors or omissions. WARNING: These products may contain chemicals known to the State of California to cause cancer and birth defects or other reproductive harm.